The Health Action NM team is grateful for the support you have given us over the years. Your generous contributions make our work possible. We hope this year, you will continue to support our organization. As you know, Health Action NM works tirelessly to pursue a positive vision of health care in our state. That vision is that every single person in New Mexico has affordable, accessible, accountable health care. Over the past year, we have not only @healthactionnm/whats-at-stake-in-health-care-1c26f907d301" target="_blank" data-href="https://medium.com/@healthactionnm/whats-at-stake-in-health-care-1c26f907d301">taken on efforts to roll back our coverage gains, but also laid the groundwork for a positive agenda. But we can’t do it without your support. Your donation can have a positive impact on the lives of thousands of people in New Mexico. The Affordable Care Act (ACA) ushered in a new era of health care in America. Insurance companies can no longer deny coverage due to pre-existing conditions; lifetime and annual caps on coverage are banned; all plans must cover free preventive services; financial assistance is available low-income and middle class families; and Medicaid is expanded to people in need. New Mexico saw the largest drop in the percent of people who are uninsured, falling from 28% in 2013 to 13% in 2016. We should celebrate this incredible accomplishment and build upon our progress to ensure every person in our state and country are covered by quality health coverage. A barrage of federal policy changes threatens to dismantle the gains we made. After several failed attempts to repeal and replace the ACA, GOP Members of Congress are now publicly discussing another attempt to dismantle the law next year. Previous versions would have capped and slashed Medicaid by over $1 trillion, dismantled the ACA’s pre-existing condition protections, raised premiums on people who need care the most, and eliminated the essential health benefits. Congress repealed the individual responsibility provision of the ACA, which the Congressional Budget Office estimates will lead to 13 million people becoming uninsured over the next 10 years, including 90,000 New Mexicans. And most recently, the administration refused to defend pre-existing condition protections in court, arguing that critical protections should be struck down in case called Texas v United States. Experts say it “would have ramifications in almost every aspect of the health insurance market and the health care delivery system,” leading to widespread chaos. 27% of New Mexicans have a pre-existing condition and would be at risk of being locked out of health coverage if the court sides with the Trump administration. In the absence of leadership at the federal level, states must take action to protect the critical gains made under the ACA. This presents an opportunity to build upon what works and fix what isn’t working. Health Action NM supports a wide array of policy options that would do just that. According to a 2018 survey, 92% of working-age adults think that all Americans should have the right to affordable health care. Ultimately, Americans need certainty that Congress and the federal administration will work to make the health law work and will commit to building upon the successes of the health law and identify areas of agreement. We urge leaders to come together to work for the common good and meet people’s expectation of a health system that is accessible and affordable for all people. Do you support the full array of the Affordable Care Act’s consumer protections, including pre-existing condition protections and essential health benefits? What are your ideas for protecting and building upon the coverage gains made under the Affordable Care Act? How do we get make sure every single person can get the care they need, when they need it, at a cost they can afford? Health Action New Mexico is a 501c3 non-profit and does not endorse candidates for public office. The following letter was submitted to the US Department of Health and Human Services on April 23, 2018. Health Action NM is a non-profit consumer advocacy organization that has served New Mexico since 1995. The organization has conducted extensive community outreach over the past several years to educate New Mexicans about new health coverage options under the Affordable Care Act (ACA). Our staff has held over 500 community events across 13 counties since 2013, reaching 17,000 individuals and families and connecting over 5,000 with enrollment assistance and health system navigation services. The education and assistance provided by Health Action New Mexico gave our staff a deep understanding of the rural, underserved, and hardworking communities across our state and the struggles that they face as they attempt to get the coverage and care they need to stay healthy. There is a need for high quality, affordable health coverage in every community of our great state. Prior to the enactment of the Affordable Care Act (ACA), people with pre-existing conditions could be denied coverage or charged exorbitant premiums in the individual health insurance market, leaving many of the sickest patients without any meaningful way to protect against the high cost of health care. President Donald J. Trump made numerous commitments to protecting people with pre-existing conditions, protections which enjoy support from a large majority of Americans. The proposed regulations submitted by the Department of Health and Human Services regarding short-term limited duration plans violate the principle that people living with illness should not be subject to discrimination due to their health status. Moreover, according to the National Association of Insurance Commissioners, these regulations would have the effect of separating healthy people into a market that puts them at greater risk of facing financial hardship if they do become sick or injured, while increasing premiums in the ACA-compliant individual health insurance market that covers people with higher medical needs. The overall impact will be to shift costs towards individuals who are sicker. According to a recent report by the non-partisan Kaiser Family Foundation, “Mid-year results from 2017 suggest the individual market is stabilizing and insurers in this market are regaining profitability. Insurer financial results show no sign of a market collapse. Second quarter premium and claims data from 2017 support the notion that 2017 premium increases were necessary as a one-time market correction to adjust for a sicker-than-expected risk pool. Although individual market enrollees appear on average to be sicker than the market pre-ACA, data on hospitalizations in this market suggest that the risk pool is stable on average and not getting progressively sicker as of early 2017.” We are on the verge of a stable individual marketplace that works for Americans. Segmenting healthier people out of the market will undermine the insurance that people who desperately need care rely upon. Health Action NM recognizes the need to bring down health insurance premiums for Americans. However, we do not believe the correct strategy for achieving this goal is to shift costs to people with greater health needs and re-invent a system of discrimination against people with pre-existing conditions. Instead, the federal government should continue to encourage states to apply for reinsurance through a 1332 waiver, increase funding for outreach and enrollment, and request that Congress pursue cost-effective policy changes that will have positive effects on the individual marketplace. We urge the department to rescind the proposed regulation. Health Action NM and the Office of the Superintendent of Insurance are teaming up to give you the information you need to access your mental health and free preventive benefits. Your health insurance must cover these benefits. Please join us for a live webinar on March 22, 2018 at 9:30 AM. Get the most out of your health insurance: Your right to services for mental health, alcohol or drug use problems. This brief presentation will review the history of mental health parity and use a plain language video to demonstrate how health plans are required to give equal importance to the health of both the body and the mind. The presentation will highlight red flags that a consumer may encounter that signals unequal access to mental health services or services to address alcohol and drug problems. For example, if a health plan restricts access to services by requiring use of lower cost therapies before accessing other types of services, or not having enough providers in their network. The presentation will use case scenarios to illustrate how the problems with equal access may look to a consumer, and how these can be resolved. The presentation will conclude with clear advice about how to file a complaint with health insurance companies and how to contact OSI for further support in resolving problems. Get the most out of your health insurance: Your right to no-cost prevention services. This brief presentation will use plain language to review the basics of “cost-sharing”, or co-pays and deductibles, and emphasize that preventive care services are available to consumers at no cost, or “cost-sharing free”. The presentation will describe what is typically included in a well-person exam and what are common preventive care services, as well as provide a complete list of preventive care services that consumers can expect to receive at no cost. The presentation will highlight red flags that a consumer may encounter when accessing preventive services and provide advice about how to be a smart consumer when it comes to using preventive services. Important tips for Bronze plan users will be included. The presentation will use case scenarios to illustrate common problems in accessing preventive services, and how these can be resolved. New Mexico should allow people use their own dollars and tax credits to purchase health coverage through the state Medicaid program. Medicaid is a public health coverage program that provides New Mexico’s children, families, people with disabilities, and older adults with comprehensive health care benefits. Medicaid is a trusted, proven program that has served New Mexico for more than 50 years. More than 40% of New Mexicans are already covered by Medicaid. New Mexicans want high quality health coverage. Medicaid covers the ten essential health benefits plus dental and vision care. 93% of office-based physicians accept new Medicaid patients in New Mexico, according to a 2015 study from the Center for Disease Control & Prevention. New Mexicans want affordable health coverage. Medicaid for adults costs $297 per person a month according to the Kaiser Family Foundation, compared to the average $520 premium per month for employer insurance. Tax credits and employer contributions could make health coverage even more affordable for working families. New Mexico could be a national leader in expanding affordable health care. With a bold vision and smart planning, New Mexico could be the first state to take the innovative approach of a Medicaid buy-in. Congressman Ben Ray Luján has introduced federal legislation using the Medicaid buy-in model. SM 3 & HM 9 request the Legislative Health and Human Services Committee to study how a Medicaid buy-in could work in New Mexico. The bills passed with bipartisan support during the legislative session. The Legislative Health and Human Services Committee will study the concept throughout the summer! Check our website regularly for updates. Let’s work together to make sure every person in New Mexico can get the care they need to be healthy. Given that this will be a short session and the governor’s final year in office, the 2018 New Mexico legislative session probably won’t be all about passing sweeping legislation. Instead, it will lay the groundwork for the 2019 session and beyond. Health Action NM plans to advocate for ideas that will improve health and increase access to care. The Big Idea: Medicaid provides comprehensive health benefits at a lower cost than private insurance. We should allow everyone to participate in Medicaid by letting people and small businesses use their own dollars and tax credits to buy Medicaid coverage. The Bill: SM 3 & HM 9 request the Legislative Health and Human Services Committee to explore how a “Medicaid buy-in” could expand health coverage and make health care more affordable for the people of New Mexico. The Bottom Line: Everyone should be able to get the health care they need without breaking the bank. Let’s bring our values to life by giving the people of New Mexico a new option so that they can make the choice that works best for their family. The Big Idea: Policy changes at the federal level may destabilize New Mexico’s health care system and disrupt access to care. The repeal of the individual mandate, re-introduction of “junk insurance,” and end of federal cost sharing subsidies could put people’s health and wallets in jeopardy. The task force will explore an exciting new idea: automatic enrollment for people who are uninsured and eligible for no-cost or low-cost health care. The Bill: SM 7 directs the Office of the Superintendent of Insurance to set up a task force to study disruptions to New Mexico’s individual health insurance market and report recommendations to the Legislative Health and Human Services Committee. The Bottom Line: New Mexico needs to take a proactive approach to protect people’s health care. The Big Idea: Prescription medication costs are skyrocketing, straining pocketbooks and the state budget. A recent Legislative Finance Committee analysis found that prescription medication spending in New Mexico jumped from $442 million in 2014 to $738 million in 2017, due in large part to price increases. A number of state agencies purchase medications but there is no communication with one another about purchasing decisions. By coming together, state agencies can negotiate better deals for taxpayers and begin to address the unfair pricing practices of pharmaceutical companies. The Bill: SB 8 and HB 59 bring together state agencies that purchase prescription medications to find cost savings through smarter, better-coordinated purchasing decisions. The Bottom Line: Prescription medication costs are rising at an unsustainable rate and New Mexico do everything in its power to get the best possible deal. The Big Idea: Health care costs are always on the rise, outpacing wage increases and making it difficult for New Mexicans to afford health coverage. And yet, the state does not have any formal body to look at what’s driving health spending or make recommendations on how to make health care more affordable. Many states have set up cost commissions to take the problem of health care costs head on, leading to savings and innovation. The Bill: HM 29 would task the Office of the Superintendent of Insurance to establish a working group to identify priorities for a health cost commission and draft legislation for the 2019 session. The Bottom Line: New Mexicans want access to high quality affordable health care and it’s time for the state to take affordability head on. The Big Idea: Medicaid is a public health coverage program that gives kids, people with disabilities, older adults, and working New Mexicans access to high quality health care. Medicaid saw a wave of cuts over the past few years. With 42% of people in New Mexico relying on Medicaid for their health care needs, it is essential that we fully invest in their health so that our families and neighbors can live healthy lives. The Bill: SB 192 assesses a fee on certain health care providers in order to draw down federal matching dollars and improve Medicaid doctor and facility payments. Several other potential proposals may be included in the state budget. The Bottom Line: New Mexico should stand by our commitment to invest in our people’s health. Medicaid buy-in study passes the legislature! On Wednesday, February 7th, the New Mexico Senate joined the House in approving a study that will explore allowing residents of New Mexico to purchase Medicaid coverage through a buy-in option. The enabling memorial was sponsored by Representative Debbie Armstrong (co-sponsored by Representative Nathan Small) and Senator Jerry Ortiz y Pino. Despite progress under the Affordable Care Act, 180,000 New Mexicans remain uninsured and many face high deductibles and co-payments. The study will consider similar initiatives in other states, potential costs and savings of a Medicaid buy-in program, federal waivers that may improve the viability of a Medicaid buy-in program, and the impact on patients, consumers, and other health care stakeholders. The effort is supported by community and advocacy groups such as Health Action New Mexico, Strong Families New Mexico, the New Mexico Center on Law and Poverty, and the New Mexico Together For Healthcare Campaign. Today (November 28) the Bill & Melinda Gates Foundation will match your donation to Health Action NM. We are more committed than ever to defending the health care protections in place now and expanding health care to every person in New Mexico. In fact, we want you to be the first to know that our staff has been working on a brand new initiative to do just that. If you donate today, we will invite you to get the first look at a brand new Health Action NM initiative that will bring down premiums and deductibles while moving New Mexico a step closer to universal coverage. Donate today on Facebook to get a matching donation from the Bill & Melinda Gates Foundation. If you don't have Facebook, you can start a monthly tax deductible donation through MobileCause. "2017 has been a trying year. But together, we have defended progress and made strides towards a better future. We are thankful for all those who make our work possible by contributing their tax deductible donation to Health Action NM." ALBUQUERQUE — A new report by Health Action New Mexico shows that premiums may be much less expensive in 2018 for New Mexicans who receive financial assistance under the Affordable Care Act. The report uses data from healthcare.gov to show the lowest cost options in each plan category that are available for the 2018 plan year. One example shows that a family of four earning $70,000 per year in Roswell, NM could cover the whole family with a Bronze plan for $0 per month, a Silver plan for $484 per month, or a Gold plan for $220 per month. Bronze plans offer the least financial protection while Gold plans generally offer the most. For lower income consumers, Silver plans offer enhanced financial protection through cost sharing reductions. The shift in prices is mostly attributed to insurers and state regulators reacting to the Trump administration’s decision to end cost sharing reduction payments. Insurers are still required to discount co-payments, coinsurance, and deductibles for lower income enrollees but the federal government will no longer reimburse them for it. Ending these payments has caused premiums to go up. However, premium assistance is still available, and because it rises alongside increases in the benchmark silver plan, plans that have risen at a slower rate have become much more affordable. On the other hand, those who don’t qualify for financial assistance will likely find themselves in a situation where premiums are substantially higher than they were last year due to the Trump administration’s actions. Still, other plans may be a better deal than others, such as the lowest cost Gold plan which costs less than the lowest cost Silver plan. The Kaiser Family Foundation found that nationally "70% of subsidy eligible-uninsured are able to purchase a Bronze plan for nothing or less than the cost of the individual mandate penalty." The penalty for lacking insurance is $695 per adult or 2.5% of income, whichever is higher. Open enrollment is underway and ends on December 15, 2017. Free local assistance is available at BeWellNM enrollment centers. Last week, the US House of Representatives passed a bill that would end Medicaid as we know it and cut it by $839 billion, weaken pre-existing condition protections, and cut taxes for the wealthiest Americans. Supporters of the bill rushed to the airwaves and lied about Trumpcare's true impacts. 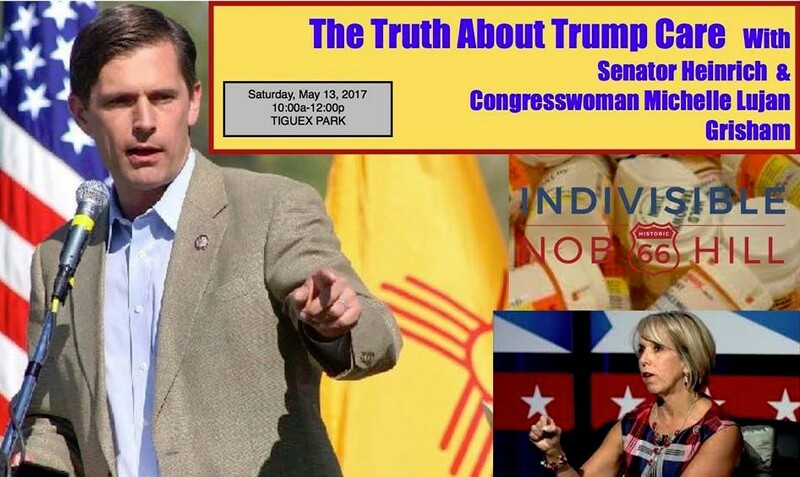 That's why US Senator Martin Heinrich and Congresswoman Michelle Lujan Grisham are teaming up with local leaders and advocates to tell the truth about this devastating bill. This event was organized by Indivisible Nob Hill. 1. Call Governor Martinez TODAY (505-476-2200) and ask her to vocally defend Medicaid and oppose the repeal of Medicaid Expansion. It will only take a couple of minutes. Like other Republican policymakers that have been outspoken in their support of Medicaid, our Governor can take a public stance with her colleagues to urge them not to repeal the Medicaid expansion. 2. Call your elected representatives and tell them what you think about Trumpcare. You can find your House representative’s number here - let them know what you think about their vote on Trumpcare. And click here find your Senator's numbers - tell them to vote NO on Trumpcare . 3. Share your story about how Medicaid and the ACA have helped you or a loved one. Your story can make a difference. It is the most powerful tool we have in our fight to protect and expand access to quality health care. Send us your story and share your story with Senator Martin Heinrich.